Deposed President Mohammed Morsi appeals conviction for violence against police and espionage. Deposed Egyptian President Mohammed Morsi has filed an appeal against his two sentences of death and life in prison. According to Abdel-Moneim Abdel-Maqsud, one of Morsi's defense lawyers, told Egyptian media that the court ruling was based on flawed evidence. Morsi, who represented the Muslim Brotherhood, was elected in 2012 and overthrown in the 2013 military coup. This past June he was sentenced to death for allegedly participating in violence against the police during the 2011 uprising against dictator Hosni Mubarak. Morsi was also sentenced to life in prison for espionage. 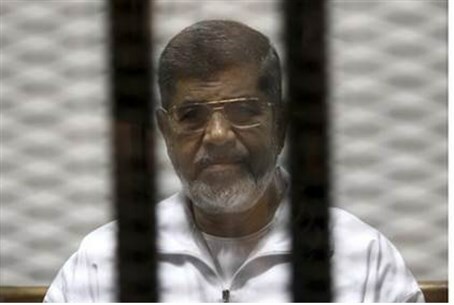 Amnesty International called Morsi's trial "grossly unfair." Current President Abdel Fattah al-Sisi has acted strongly against the Muslim Brotherhood. Under his rule the group, including its Palestinian branch Hamas, has been outlawed and hundreds of its members and supports have been imprisoned. Seven have been executed.